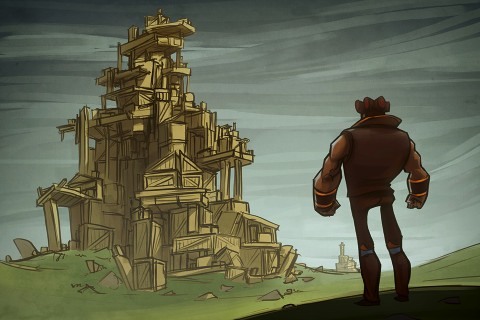 The Ragnar Rock Thor’s Revenge app by PlayLevel for iPhone takes you to Midgaard where you (Thor) must destroy fortresses and structures, destroy the dwarves, rescue villagers and try to get your hammer back. Loki stole your magic hammer and retreated behind his army of dwarves. Thor must destroy Loki’s army by hitting the dwarves with his hammer. The first hammer you get in Thor’s revenge is the basic hammer. Thor throws the hammer. You throw the hammer by placing your finger on top of the hammer, drawing backwards to aim and releasing your finger. It hits the structure and knocks stuff over. As you advance in levels, you get the boomerang hammer, the bomb hammer and the hammer with super speed. 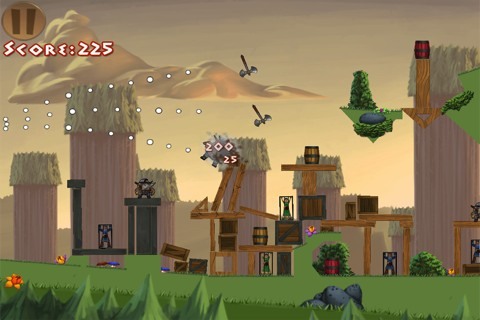 Thor’s Revenge holds to the same premise as Angry Birds. The difference lays in the graphics and story line. Instead of birds, you get hammers. Instead of pigs, you have dwarves. Still, Thor’s Revenge remains enjoyable to play and for a free application you don’t have anything to lose downloading it. The audio in Thor’s Revenge entertains while during game play. The standard audio . Thor grunts when he throws his hammer. Impact on the structures is met with a crashing sound. When you win, a victorious jingle. Failure to complete a level is met with a “Wah-Wah” sound. As you complete levels, you get a rating underneath depending on your score. High scores get three star ratings. Thor’s Revenge come with three episodes. The first episode consists of twelve levels. Episode two contains eight levels. Episode three contains twelve levels. PlayLevel shows a level four “Coming Soon.” It appears they update the game regularly with new levels, hammers and challenges. Each level shows an image on the icon. This icon represents the goal of that level: destroying dwarves, saving villagers or gaining money. Ragnar Rock Thor’s Revenge entertains with its simplistic idea. It provides hours of fun as you attempt to gain your hammer back from Loki. I recommend this application for when you run out of levels on other similar games. Thor’s Revenge works on all iOS devices including the iPod touch. This iPhone app requires at least a 4.3 firmware on your iOS device. It also only supports 3rd generation iOS devices or higher. They also provide a disclaimer that the app may run slower on older devices. Those using an iPhone 4 or 4S will not experience a disruption in play time. This review of Ragnar Rock Thor´s Revenge was conducted using an iPhone 4 running iOS 5.0.1 firmware. AppSafari review of Ragnar Rock Thor’s Revenge was written by Darius Reimm on April 10th, 2012 and categorized under App Store, Games, iPad apps, Puzzler, Strategy, Universal. Page viewed 4065 times, 1 so far today. Need help on using these apps? Please read the Help Page.